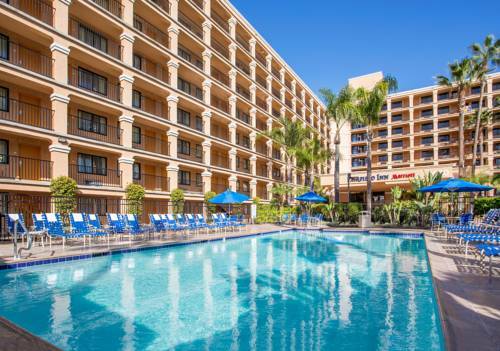 Find the magic at Fairfield Inn Anaheim Resort, conveniently located across the street from Disneyland and near popular attractions including Downtown Disney District, Anaheim Convention Center and Angel Stadium. After a fun-filled day at area theme parks, retire to spacious guest rooms featuring free Wi-Fi. Perfect for group travel, many rooms are connected. Visit our new lobby area, featuring a kid's space, and purchase theme park tickets at our front desk to avoid long lines. Fill up with our three dining options, including Pizza Hut Express, Panera Bread and Seattle's Best Coffee. During downtime, grab the sunscreen and go for a swim, or stay active in our new fitness center equipped with the latest in cardio and stretch equipment. Personal meetings are welcome in our event room for up to 40 guests. At Fairfield Inn Anaheim Resort, youre our #1 priority. Ask us about The Fairfield 100% Guarantee , where we promise you'll be satisfied or we'll make it right. That's our commitment to you. Panera Bread offers a crafted menu of soups, salads and sandwiches that we are proud to feed our families. We bake fresh bread from fresh dough every day. No artificial preservatives or short cuts, just bakers with simple ingredients and hot ovens.